Almonds are a tree nut that provide several health benefits. They do not require refrigeration and are easily portable, making them a sensible snack, side dish to any meal, or flavor enhancer for many dishes. Unlike many other nuts, almonds contain high levels of "healthy" fat, which are good for your health. Raw almonds have increased health benefits over processed almonds such as roasted or flavored almonds. Almonds are an excellent source of monounsaturated fat, the same type of fat found in olive oil that has positive health benefits. Consumption of monounsaturated fat is linked with reduced cardiovascular disease. One serving of almonds, or 23 whole kernels, contains 18 grams of fat, 11 grams of which is monounsaturated fat. Almonds have riboflavin, or vitamin B-2, which is used by the body to complete red blood cell production and metabolize carbohydrates to provide you with energy. One serving of almonds contains almost 18 percent of your daily value of riboflavin. Also, a quarter-cup of almonds provides 45 percent of your daily value of manganese and 20 percent of copper. These two minerals are used by your body to produce enzymes that inhibit the release of free radicals, which are associated with the aging process. One serving of almonds contains 7.62 grams of protein. For comparison, a typical egg contains only 5.54 grams of protein. The recommended daily value of protein for a 2,000-calorie diet is 50 grams per day, so a quarter-cup serving of almonds has approximately 15 percent of the recommended daily value for protein. Twenty-three whole kernels of almonds supplies 5.6 grams of carbohydrates, including 3.3 grams of fiber, which is 13 percent of the daily recommended value of fiber. Almonds have no cholesterol and only a negligible amount of sodium. Almonds also contain around 206 milligrams of potassium compared with a banana, which contains 290 milligrams of potassium. Roasted almonds actually are cooked in a process similar to frying with coconut oil or palm kernel oil, so they usually contain increased saturated fats, which are associated with high levels of LDL cholesterol and increased thickness of artery walls. Additionally, almonds contain a significant amount of oxalates, which can crystallize in the body and create health issues if you have kidney or gallbladder problems. Many people also develop allergies to almonds. 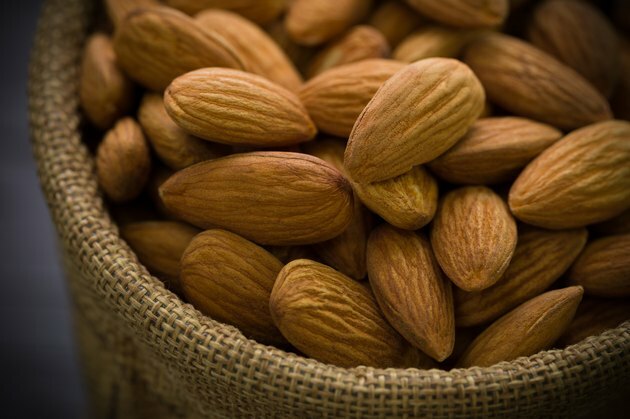 If you experience allergic symptoms, including tingling or numbness to your lips or mouth while eating almonds, you might be developing an allergic response and should not eat almonds.